Historically, Wellesbourne was wholly agricultural, its few artisans dedicated to the making and mending of the equipment necessary to allow this process to run smoothly. Medieval documents, for instance, refer to 'Peter the wheelwright' and it is in the tail end of this tradition that we have the Chedham family. Thomas Chedham was born in Ledbury, Herefordshire in 1789, and after a basic education, a seven year apprenticeship, marriage and brief periods of work elsewhere, settled in Chapel Street, Wellesbourne between 1816-1817 with his wife Mary and two small boys, Henry and Frederick. After working the initial years with John Bettridge, the local established wheelwright, Thomas made a tenancy agreement with the Riley family for the yard and premises as they now stand in Church Walk. The workshops had been quickly erected to this end. There was stiff competition for work; Wellesbourne had several practicing blacksmiths and the one wheelwright, John Betteridge, but Thomas’ landlords offered introductions to an extensive farming fraternity. By 1826 and for the next fifteen years, Rileys and their associates provided the backbone of their workload with repairs to vehicles, shoeing and the occasional commissions for a new cart or wagon. His older brother Henry was resigned to a more settled existence and worked on with his father in Wellesbourne until 1845 when he moved with his wife Caroline (daughter of William Bustin, the local miller) and three young children to Guy Street, Warwick. He went into partnership with the aforementioned Thomas Tonge, and as 'Tonge & Chedham' they recruited other young craftsmen and advertised themselves as 'machine makers, wheelwrights, blacksmiths, millwrights and timber merchants. They operated from Gotten End (now reduced to Coten) in the former almshouses, part of which is now the 'Millwrights Arms' public house. The 1840's saw the Riley's bankrupt and they disappeared from Wellesbourne life, their property in Church Walk reverting to the mortgagees. Thomas Chedham resumed his tenancy and found a new clientele. He also married his third wife Hannah, a young widow. This marriage was short-lived as she died in 1847 and it marked the start of further problems for Thomas with another bankruptcy in 1851. A possible financial link to Henry's enterprise at Warwick, which folded about the same time, brought about a role reversal; Henry and his now much larger family returned to Wellesbourne to take on the Church Walk tenancy and his father, Thomas, ceased running his own business and moved to Emscote to live alone. His two daughters; Eliza and Ann, had both married just prior to this. Thomas died at Emscote in 1856, being described as 'journeyman wheelwright' on his death certificate. He was 67. Henry pressed on with the Church Walk business, his background with machinery holding him in good stead. By the 1860's he diversified by running a corn threshing service alongside the repair business. Great assistance was offered by fortune of his children; Henry and Caroline had reared five sons and two daughters to adulthood. Thomas and William, the two older boys, followed the family tradition, both training as wheelwrights and William specialising in blacksmithing in later years. John involved himself with steam engines while the younger boys, Henry and Albert, remained with hand tools and wood. Of the girls, Caroline married a local shopkeeper and Mary Ann remained a spinster at home, presumably helping her mother with the endless domestic duties that beset Victorian females. In 1865, Thomas married a servant girl from Stratford, another Caroline, and took his allotted share of money to start a business in Church Street, Northfield, in the footsteps of his uncle, Henry Hanson (husband of Eliza). Caroline had seven sons by 1880, the eldest inherited his grandfather's name and trade and carried on wheelwrighting at this address until well into the 20th century. 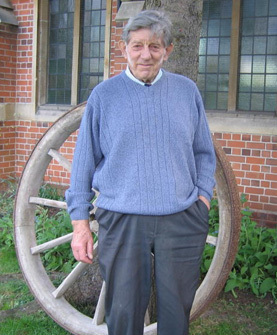 Back in Wellesbourne, of Henry's younger sons, John worked around, helping his brother at Northfield in the early years, his family in Church Walk, Bettridge’s in Wellesbourne Hastings and in the winter months he worked for himself with his own threshing machine. Henry junior married Hannah Faulkner from Chesterton, moved to an adjacent cottage, 26 Church Walk, and remained working at the yard with his father and older brother William. Albert, the youngest boy, married and went off to Leamington to train as a cabinet maker. For Henry, later life was to deliver some severe blows, with the death of his wife in 1886, followed soon after by the sudden deaths of several grand-children and his bachelor son William, on whom he relied for all the smithing work and who presumably would have inherited the business. Further anxieties followed; until now Henry had paid a 35s annual rent for the workshops and farmhouse but with the death of his Leicestershire landlord, the entire property together with the four cottages was put up for sale and auctioned at the King's Head in October 1890. Fortunately, he secured it for £400, gathered the deposit and made a hurried mortgage agreement with the Oddfellow Society. For all of this they remained a close-knit family; in 1891 for instance, Henry shared the house with his widowed daughter Caroline and her daughter Minn; Mary Ann, a spinster daughter; his grandson William, a blacksmith; and Henry junior's sons, William and Frederick, as an overspill from a small cottage nearby and his wife’s aged spinster sister Elizabeth Bustin. Henry died in 1896, leaving the business to Henry and Albert together with their shares in three steam engines and three threshing machines. Following this, Albert and his second wife returned to Church Walk although his involvement with the yard was short lived, choosing to relinquish his share of the business. With the proceeds, Albert purchased three cottages further down Church Walk and for a short time operated a Fish & Chip shop at No. 10. With the turn of the new century, the advent of the internal combustion engine and pneumatic tyres placed dependency on horses and the vehicles they drew into a steady decline. Henry junior faced this with the next generation of Chedhams, his three sons, William, Frederic and Albert and four remaining daughters, Sarah Anne, Elizabeth, Caroline and Kate. Wagon repairs formed the main occupation for the young wheelwright Frederic while the others continued the threshing of corn and sawing timber. William served in the Rifle Brigade in World War I, but for him, Fred and three of his sisters they otherwise remained at home and single. After Henry junior's death in 1922, the ageing steam engines were replaced by paraffin powered 'Titan' Internationals and these were used until the 1960's to pull the threshing machines. All else remained much the same. The youngest boy Albert met his future wife Eveline at Moreton Paddox where she worked in service, the couple marrying in 1926 and moving to Warwick Road. They had two children: William Henry, born in 1928 and a daughter Betty born four years later. As his mother and siblings gradually died off, Albert ultimately assumed ownership of the property and with his son 'Bill' carried on a variety of repair works which became increasingly remote from wheelwrighting. When the last threshing machine was towed back to the yard and dismantled in 1964 it was a gentle closure to a lost era. Albert died in 1965, and the yard closed for business. 'Bill' took his many talents to Flint Hall, just outside Wellesbourne, to work for Bryant Lean who farmed cattle and cereals. Bill's tasks involved building and vehicle repairs, but he's perhaps best remembered for his ability to modify standard vehicles for more specialised uses. He retired in 1993.